A 2-day event that brings together medical professionals and cannabis industry experts. 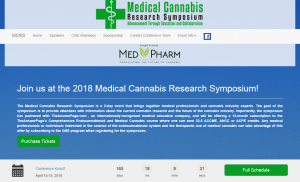 The goal of the symposium is to provide attendees with information about the current cannabis research and the future of the cannabis industry. Importantly, the symposium has partnered with TheAnswerPage.com , an internationally-recognized medical education company, and will be offering a 12-month subscription to the TheAnswerPage’s Comprehensive Endocannabinoid and Medical Cannabis course where one can earn 22.5 ACCME, ANCC or ACPE credits. Any medical professionals or individuals interested in the science of the endocannabinoid system and the therapeutic use of medical cannabis can take advantage of this offer by subscribing to the CME program when registering for the symposium. Eugene began his football career as an offensive lineman in high school, where he was ranked the number three player in the United States and graduated eighth in his class. Eugene was a unanimous All-ACC selection, voted the ACC’s top blocker, and was regarded as the most dominating offensive lineman in college football. He was drafted eighth overall in the 2009 NFL Draft by the Jacksonville Jaguars. In October 2013, Super Bowl champion Baltimore Ravens orchestrated a trade to acquire the star left tackle. During his time in the NFL, Eugene was consistently graded as one of the League’s best pass blockers. On July 21, 2016, after 18 years of playing football, Eugene made the difficult decision to retire from the NFL so he could focus on his personal health and spend more valuable time with his wife and three children. Since retiring, Eugene has become the lead advocate for medical cannabis research and policy reform in the NFL. Eugene demonstrates his commitment to education and policy reform by serving as a board member of the NFLPA Pain Management Committee and the HealthyUNow Foundation (supporting the Autism community), and is the Athletic Ambassador for Doctors for Cannabis Regulation. He is also co-author of the book Youth Sports: Start Here: Everything You Need to Know About Promoting Health and Preventing Injury for Your Young Athlete. Eugene looks to add value in communities by partnering, donating and investing in community programs and medical research, and educating the broader community by speaking at healthcare and medical cannabis conferences. He is also a partner at Green Thumb Industries (GTI), one of the country’s leading medical cannabis cultivation and dispensary facilities. At GTI, Eugene works towards bringing dignified and safe access to medical cannabis patients in need. Eugene is dedicated to educating the public on how these medications can be used safely and as non-addictive alternatives to prescription opioids. Award-winning pioneer in the cannabis industry who is the Co-founder and CEO of Medicine Man in Colorado, a nationally recognized cannabis brand and industry leader. Lifelong entrepreneur who partnered in the founding of Medicine Man Technologies, an OTCBQ publicly traded cannabis consulting company, and MedPharm, a company focused on expanding medical cannabis science in a pharma-grade environment. Passionate cannabis advocate dedicated to advancing the industry through community service, transparency, advocacy, mentoring, innovation, and political cooperation. Industrial engineer with extensive experience in manufacturing environments. Technical program/portfolio manager focused on strategic programs, enterprise portfolios, and business architecture for large-scale operations. Dr. Greg Carter is chief medical officer of St Luke’s Rehabilitation Institute in Spokane, WA and is a clinical professor in the Elson S. Floyd College of Medicine at Washington State University. His clinical research has focused on improving the rehabilitative and palliative care of patients with severe chronic neuromuscular disorders. He was among the first investigators to report the usefulness of cannabis in the palliative management of amyotrophic lateral sclerosis. He has received the Distinguished Researcher Award from the American Association of Neuromuscular and Electrodiagnostic Medicine, the Best Research Paper Award from the American Academy of Physical Medicine and Rehabilitation, the Excellence in Research Writing Award from the Association of Academic Physiatrists and the Excellence in Clinical Care Award from the Muscular Dystrophy Association. J. Michael Bostwick, MD, is Professor of Psychiatry in the Mayo Clinic College of Medicine and Senior Associate Dean for Admissions at Mayo Medical School in Rochester, MN. He has published extensively on suicide epidemiology and prevention, medical marijuana, and numerous psychosomatic topics, and serves on editorial boards for two medical journals. He is an avid teacher at all levels of Mayo’s medical school and psychiatry residency, and frequently collaborates with trainees on research and writing projects. He holds undergraduate degrees from Yale University and the University of Hawaii in Art History and Zoology respectively. He attended Brown University for medical school, but in the interim between college and medical school was a newspaper reporter for the Cape Cod Times. He is a serious clarinetist and sings in a semi-professional choir in Rochester. He and his wife, Connie Williams, enjoy cooking elaborate gourmet meals together, and he maintains a perennial garden with several hundred species, including many prairie natives. He is father to 21-year-old twins, Hannah and Gabriel. Dr. Michelle Sexton began her career as a homebirth midwife and herbalist. She earned her Doctorate in Naturopathic Medicine from Bastyr University in Seattle Washington, 2008. She completed a postdoctoral fellowship at the University of Washington in the Departments of Pharmacology and Psychiatry and Behavioral Sciences. Her NIH-funded pre-doctoral and postdoctoral research was on the topic of cannabinoids and their roles in neuroinflammation and neurodegeneration. Her postdoctoral project investigated cannabis use and impact on endocannabinoids and inflammatory markers in patients with Multiple Sclerosis. Dr. Sexton is the Medical Research Director at the Center for the Study of Cannabis and Social Policy. She is voluntary clinical faculty at UCSD in the Department of Family Medicine and Public Health. She serves as an editor and technical advisor for the American Herbal Pharmacopoeia Cannabis Monograph. She has presented her research internationally and is published in peer-reviewed journals. Dr. Sexton’s clinical practice, research and teaching focus is on the medical use of cannabis across a range of conditions and age groups. She is a member of the International Cannabinoid Research Society, the International Association of Cannabinoid Medicine and the Society of Cannabis Clinicians. She maintains a small medical practice in San Diego, CA. Paul Armentano is the Deputy Director of NORML, the National Organization for the Reform of Marijuana Laws, and also serves as a faculty member at Oaksterdam University. His writing and research have appeared in over 750 publications, scholarly and/or peer-reviewed journals, as well as in more than a dozen textbooks and anthologies. He is a regulator contributor to TheHill.com as well as to numerous other print and online publications. Mr. Armentano is the co-author of the book Marijuana is Safer: So Why Are We Driving People to Drink? (2009, Chelsea Green), which has been licensed and translated internationally. His most recent book, The Citizen’s Guide to State-By-State Marijuana Laws (2015), is available from Whitman Publishing. He is the 2013 Freedom Law School Health Freedom Champion of the Year and the 2013 Alfred R. Lindesmith award recipient in the achievement in the field of scholarship. Dr. Corey Burchman is Assistant Professor of Anesthesiology at the Geisel School of Medicine at Dartmouth. He has been a practicing physician for over 30 years. He is an attending physician in the Department of Anesthesiology and Critical Care and serves on the Acute Pain Service at the Dartmouth-Hitchcock Medical Center, in Lebanon, NH, practicing clinical anesthesia and interventional pain medicine. He is Medical Director of the Post Anesthesia Care Unit, and the Same Day Surgical Unit, as well as Section Chief for Neurosurgical Anesthesia. He is actively involved in medical marijuana safe access programs and is one of the Medical Advisors to Prime Alternative Treatment Centers of NH. He has been instrumental in the design and implementation of large-scale demographic studies looking at how medical cannabis can attenuate the use of prescription opioids for pain. He is engaged at a national level with education in the field of medical cannabis therapeutics, and has participated is several multistate studies examining the uses of cannabis as a substitution for analgesics and antidepressants. As a US Navy physician for over a decade, he served both on land and sea, and on deployment in the Persian Gulf. At Dartmouth, Dr. Burchman formed BBR Medical Innovations, an IP incubator for novel medical devices. BBR was recently recognized by MassChallenge as one of 128 most promising global start-ups. He is also the Founder and President Emeritus of the Global Children’s Art Programme, a global non-profit devoted to art education for children in developing nations. He has been leading medical/surgical humanitarian missions to developing nations for over 25 years. Dr. Burchman is one of the founding partners of The Brain Trust, LLC, a software company involved in education software for management and recognition of traumatic brain injury. Dr. Burchman has been writing poetry for over 40 years, and his latest published collection, “Spirits of the Playing Surface” (Shires Press) is in its second printing. One of his main interests is in the neurosciences, the study of the brain and spinal cord. He describes his work as compartmentalized, the left brain called to action for scientific investigations, his right brain for painting, writing, and, of course, roasting coffee. Dr. Burchman has a lifelong interest in what defines creativity, both anatomically, and experientially; and how possibly one can enhance the creative imprint we make upon our world. I am an Assistant Professor of Neurology, who sub-specializes in multiple sclerosis and related inflammatory disorders of the brain and spinal cord such as neuromyelitis optica (NMO), neurosarcoid, vasculitis, and neurolupus. I see patients at the Rocky Mountain Multiple Sclerosis Center at Anschutz Medical Campus, which provides a multidisciplinary approach for symptomatic and immunological therapy and ability to conduct translational research. I am interested in improving clinical outcomes in patients with neuroimmunological conditions and particularly in using biomarkers to help diagnose patients sooner and to determine the best treatment options. This includes comparative effective research into which drugs to use and evaluating their effectiveness. This includes evaluating cannabis products to learn what patients are using and for what symptoms. Dr. Romero-Sandoval received an M.D. from the Centro Universitario de Occidente, Quetzaltenango (Universidad de San Carlos de Guatemala) in 1999 and a Ph.D. in Neuroscience from Universidad de Alcalá de Henares, Spain, in 2003. His postdoctoral training was completed at Wake Forest University, Winston Salem, NC (2003-2006) followed by Geisel Dartmouth Medical School, Lebanon, NH (2006-2007). Dr. Romero-Sandoval has held academic positions as Instructor (2007-2009) and Assistant Professor (2009-2012) at Geisel Dartmouth Medical School, and as Associate Professor (2013-2017) and the Director of Research (2014-2017) at Presbyterian College School of Pharmacy in Clinton, SC. Currently, Dr. Romero-Sandoval is an Associate Professor at Wake Forest University School of Medicine, Winston Salem, NC. Dr. Romero-Sandoval studies the molecular mechanisms of cannabinoid receptor activation in skin and immune cells in the induction of analgesia, resolution of inflammation, and promotion of tissue repair. The Romero-Sandoval laboratory explores the role of endocannabinoids in postoperative pain and its transition to persistent postoperative pain in addition to the function of phosphatases and kinases in spinal cord and the peripheral nervous system. Most recently Dr. Romero-Sandoval has focused on elucidating the role of macrophages in wound healing and the transition from acute to chronic pain in the context of diabetic neuropathy or surgical pain. The ultimate goal of the Romero-Sandoval lab is to restore the molecular mechanisms and cellular functions that are altered under pathological inflammatory and painful conditions. The Romero-Sandoval laboratory uses highly translatable clinical approaches such as the use of human primary cells, the use of clinically relevant functional assays, and the use of clinically tested nanotechnology for potential cell-directed gene therapies. Dr. Sue Sisley MD is an Arizona-based physician practicing Internal Medicine and Psychiatry. Learn about ‘Cannabis and Dementia’ from Dr. Sisley at the Medical Cannabis Research Symposium in Denver, CO. She works as Medical Director for medical cannabis license holders in 11 different states/territories from Hawaii to Puerto Rico to New York. Sue serves as Site Principal Investigator for the only FDA-approved randomized controlled trial in the world examining safety/efficacy of whole plant marijuana in combat veterans with treatment-resistant post traumatic stress disorder PTSD. Dr. Sisley is on faculty at Colorado State University PUEBLO campus, recruited for core planning team to organize the CSUP “ICR Institute of Cannabis Research” in Pueblo, Colorado. Dr. Sisley has been a Member of Nevada ILAC Medical Cannabis Commission for the past two years outlining regulations for laboratory testing including limits on pesticides, residual solvents and other guidelines that are currently being used as a model for other states medical cannabis laws. She also serves on the Steering Committee for Thomas Jefferson University Lambert Cannabis Medical Research Center. Marian Wilson, PhD, MPH, RN-BC is an assistant professor at Washington State University College of Nursing where she teaches research courses and is executive faculty in the Program of Excellence in Addictions Research and faculty for the Sleep and Performance Research Center. She is board certified in Pain Management Nursing from the American Nurses Credentialing Center & American Society for Pain Management Nursing. Dr. Wilson has extensive clinical expertise in acute and chronic pain care and behavioral health. She has experience as an oncology nurse and nurse scientist leading clinical research in acute care settings and has published research testing novel electronic health technologies to extend accessibility of non-pharmacologic and psychologically-based chronic disease symptom-management strategies. Her current focus is on self-management programs for persistent pain populations using online interventions. The study she presents on today is one of several she has conducted focused on addressing poorly controlled and under-recognized symptoms among people with persistent pain. This study surveyed people in medication-assisted opioid treatment programs to assess symptoms of pain, depression, anxiety and use of cannabis to relieve symptoms. Dr. Wilson has received funding for her work on symptom management from the National Center for Complementary and Integrative Heath, American Society for Pain Management Nursing, WSU Alcohol and Drug Abuse Research Program, and the Inland Northwest Community Foundation.